Ed Sheeran has announced he’s engaged to his long-time girlfriend Cherry Seaborn. Posting on Instagram he said they are both “very happy and in love”, joking that their cats are happy for them too. The couple met in school although they only got together in 2015, spending most of 2016 travelling the world during his year off from music. Cherry is a hockey star and helped England U21’s win the bronze medal at the 2012 European Championships. Last year Ed said that he’d finally had the chance to fall in love after taking a break from music.”This has been the first time I’ve ever actually had the time to fall in love properly,” he said.”I’ve always got into relationships very passionately – I’m a redhead and also Irish.” He also explained he wanted to start a family. “I’m ready, let’s go – tour bus babies, little fat, chubby babies that just walk around,” he said. 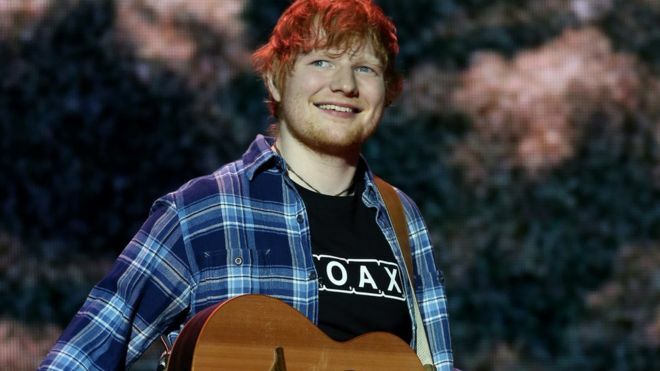 Ed was forced to cancel some of his tour dates at the end of last year after a bike accident. His single Shape of You was 2017’s biggest selling single, according to Official Charts data. He is nominated at next month’s Brit awards for album of the year, British single, British video and British male.